Honokohau Marine Storage (HMS) is here to provide safe and secure storage of your valued marine vessel. Currently we are focused on perfecting storage efficiency, cost effective security and high quality service. Rates based on, registered vessel length and payment terms; month to month, semi-annual or annual payments. $10 per ft / paid monthly. $9 per ft / paid biannually. $8 per ft / paid annually. *All rates are subject to change and subject to local State and City taxes. If you are interested in storing your vessel, please fill out the bellow application. If you'd like to know more about the facility and how you can be a customer, please fill in this form. A manager will be in touch shortly. The harbor is alive with fisherman, charters and tour operators, all providing key services to the State of Hawaii. 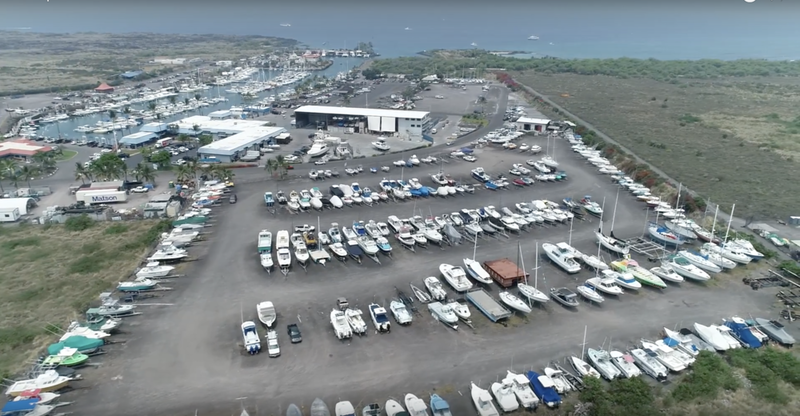 The Honokohau Marine Storage, is home to more than 300 Tenants, dedicated to their passion of being on the water. Whether it’s thrill seeking, fishing, or exploring the sea’s, the best of the best, operate from this facility, if not from the water. As new ownership, we are dedicated to providing great security and dedicated stewardship to helping more boat goers do more of what they love. Q- Do I require insurance on my vessel to remain a tenant? A- The short answer is no. However any vessel that carries insurance, we are asking that you provide proof of insurance for our records. When you provide your insurance information then our insurance cost becomes cheaper. If our cost are lower, we can help keep your cost lower. If you do not carry insurance on your vessel, we will have you execute an additional Hold Harmless, or similar statement with your Rental Agreement. Q- Why do we need to provide insurance? A- Having your insurance on-file, coupled with improved surveillance monitoring, is going to help all of us to resolve internal disputes. accidental damages or issues caused by other unforeseen circumstances. When everyone follows best practices we all benefit. When humans stop making mistakes we will stop asking for insurance. Q- What do we need to do to keep our boat in the yard? A- To maintain your storage in the yard, we request that all owners fill out the Tenant Registration form above. If you have issues with the form, just send us an email. To keep the boat in the yard past Nov. 1, 2018, a Rental Agreement need to be executed sometime in October. Rental contracts will be sent to the email we receive in the Tenant Registration form. Q- What can we expect from Honokohau Marine Storage? A- First off, we won't be shutting down the largest self store dry boat facility in the State leaving hundreds of boaters up a creek. Here are some basic improvements that we will be installing both immediately and over time. Your suggestions matter, let us know if there is something that we should be considering. Q- What do I do if my vessel is inoperable? Contact a maintenance provider who can provide a timeline of repairs. *We will updating this to include suggested providers, if you can recommend good people let us know. Q- What do I do if I get locked out? you failed to pay your bill. you need to renew your rental contract. Q- How do I pay for my storage bill? A- Payments can be made online via e-check or credit card. Written checks can be sent to; 348 Puuhale Rd. #339, Honolulu, HI 96819. We prefer not to take cash and the facility does not carry change or petty cash. If these options truly don’t work, then we can deal with that on a case by case basis. Just let us know.